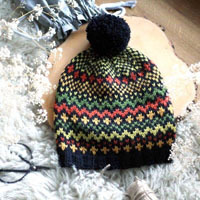 Go to original pattern for design DROPS 3-17. 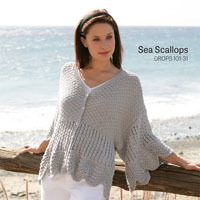 DROPS jumper with lace pattern and tube at armhole in Vienna or Melody. Size S-L.
DROPS pointed needles size 3 and 7 mm and circular needle (40 cm) size 6 mm - or size needed to obtain 11 sts x 15 rows in stocking st and 13 sts x 18 rows in lace pattern on needle size 7 mm = 10 x 10 cm. Pattern: See diagram. The diagram shows the pattern from the RS. 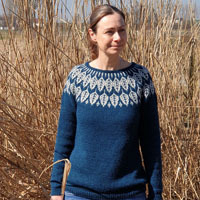 Size S: addition II, 3 repeats across the row, addition I. Size M: addition II, 4 repeats across the row. Size L: addition II, 4 repeats across the row, addition I. 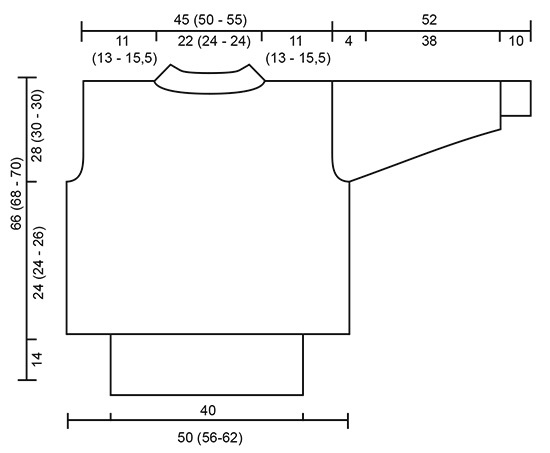 Continue in pattern like this until piece measures 38-38-40 cm and cast off for armhole each side on every other row: 3-2-3 sts 1 time, 0-2-2 sts 0-2-1 times = 59-65-71 sts. When piece measures 64-66-68 cm cast off the middle 19-21-21 sts for neck and complete each side separately. Cast off to shape the neckline: 5 sts 1 time. Cast off remaining sts on shoulder when piece measures 66-68-70 cm. Front piece: Cast on and work like back piece but cast off the middle 15-17-17 sts for neck when piece measures 63-65-67 cm. Cast off to shape the neckline on every other row: 4 sts 1 time and 3 sts 1 time. Cast off remaining sts on shoulder when piece measures 66-68-70 cm. 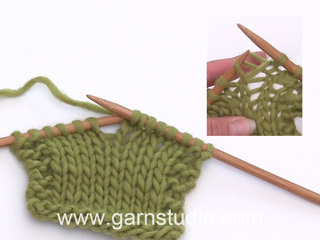 Sleeve: Worked back and forth on pointed needles. 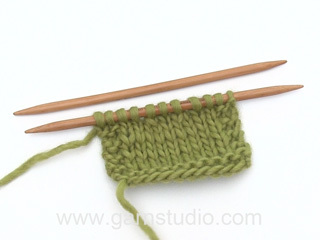 Cast on 36-38-38 sts on needle size 3 mm and work 10 cm Rib, at the same time inc 13-11-11 sts evenly on last row = 49 sts. 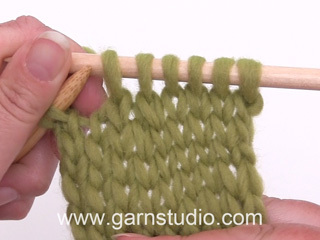 Change to needle size 7 mm and continue in lace pattern as follows from WS: addition II, 2 repeats across the row. 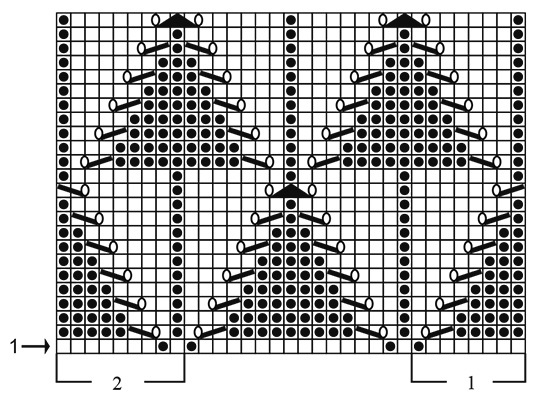 Continue in pattern like this, at the same time inc 1 st each side on every 6th row 10 times for all sizes, then 1 st each side on every 4th row 12 times for all sizes, and then 1 st on every 6th row 3 times for size M + L = 73-79-79 sts. When piece measures 48 cm cast off each side to shape the sleeve cap on every other row: 3 sts 3 times. Now pick up 9 sts on cast off sts each side and work 8 cm stocking st on all sts. Cast off. Assembly: Sew shoulder seams. 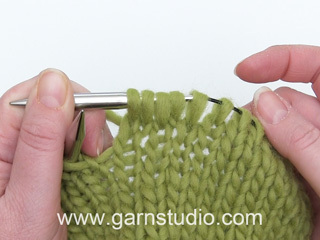 Pick up approx 60 sts round neckline on circular needle size 6 mm and work 8 cm stocking st, cast off. Sew side and sleeve seams. Set in sleeves as follows: place body piece and sleeve WS against RS with the 8 cm stocking st on sleeve towards the RS. Sew sleeve to body piece before the 8 cm stocking st, fold the piece in stocking st and sew to the same seam. The edge now sits like a tube around armhole. Er det muligt at strikke den uden de “pølser” på ærmerne? Hei Ann-Sofie. Alle pinner i hullmønsteret skal strikkes 1 gang fra rettsiden og 1 gang fra vrangsiden, med unntak av den første pinnen som kun strikkes fra vrangsiden. Da vil du se at pilene stemmer, og at den øverste raden er pinne 24. Dette var ikke tydelig nok forklart i oppskriften, vi har derfor laget en rettesle på det. Takk for beskjed og god fornøyelse.